After enjoying surging inbound visitor numbers from China in recent years, Thai tourism operators are now bracing for a slowdown in growth from this top feeder market. 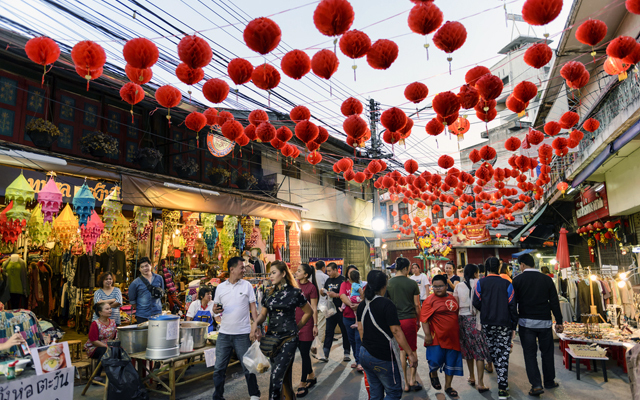 For the upcoming Chinese New Year (CNY), in early February 2019, it is unlikely that Chinese inbound figures would surpass peak performance recorded during the same period in 2018, said Supawan Tanomkieatipum, president of the Thai Hotels Association (THA). Average hotel occupancy rates in tourist provinces are not expected to exceed 80 per cent for the upcoming festival, compared with nearly 100 per cent in early 2018. About 313,000 Chinese visited Thailand during the CNY period this year, sending Chinese arrivals surging to a monthly all-time high of 1.2 million in February 2018 alone, said Supawan. Chinese inbound figures, however, took a plunge following the Phuket boat tragedy in July, falling 14.9 per cent year-on-year in September 2018 and 8.8 per cent year-on-year in 3Q2018. “Since we faced a lack of confidence in the Chinese market from middle this year, advanced bookings have been made less than a month, instead of a few months ahead previously,” said Supawan. China is among the 21 countries granted the 2,000 baht (US$61) visa-on-arrival fee exemption, applicable from December 1, 2018 to January 31, 2019, as Thailand seeks to stimulate tourism arrivals for the year-end period. Surawat Akaraworamat, vice president, the Association of Thai Travel Agents (ATTA), also foresees the recent visa fee measure would be key in restoring the Chinese market. But double-digit monthly growth rates seen for the Chinese market in 1H2018 would be impossible to replicate moving forward, he cautioned. However, Surawat believes that Thailand would remain as a favourite destination for the Chinese market come CNY 2019, although the country’s popularity would not be so high as in 2018, as charter flights shifted to nearby countries like Cambodia, Myanmar and Vietnam. It is hence opportune for tourism operators in Thailand to improve their services and rehabilitate tourist destinations in the coming year, Surawat said, adding that ATTA has instructed members to improve their operations and target quality customers for sustainable business. For now, the yuan depreciation is affecting the Chinese FITs market more than group series, as tour operators bear the burden of foreign exchange with tour packages sold in yuan, Surawat said. Still, if the trade war and yuan depreciation persist, it would seriously affect tour companies, he added. Recognising that the fast growth days of the Chinese market is over, Yuthasak Supasorn, governor of the Tourism Authority of Thailand (TAT), said the organisation now places a stronger emphasis on attracting quality tourists and increasing tourism expenditure over the number of Chinese visitors. Yuthasak told TTG Asia that TAT has recently joined forces with Chinese agents and airlines to roll out promotional campaigns, which are expected to attract 500,000 Chinese visitors to Thailand for the rest of 2018. These efforts, together with the visa fee waiver, would further yield positive results during CNY 2019, he said.